Everyone needs an extra timer and now you have access to huge ones on your Apple TV. It’s a simple question that often lingers in the back of your mind while you’re performing live. 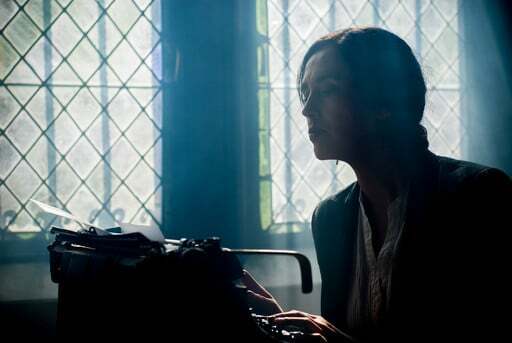 A true professional knows how to bring the show to a natural conclusion at just the right moment, but without the benefit of knowing precisely how long you have, you’re at a loss. Fin was created to solve this problem in the most elegant way possible. Take your iPad, iPhone, or Apple TV, place it somewhere in front of you, and let the timer run as you deliver the best performance of your life. You’ll know when your time is almost up, but no one else will. If you run conferences, toastmasters meetings, or other kinds of live events, you’ll appreciate how well Fin keeps your talent on schedule. Rather than having someone in the front of the room holding up cards for 5 minutes, 2 minutes, and so on, let Fin do the job for you. Fin will turn the entire background of the screen different colors at warning times you specify. (Yellow, Orange, and Red, or the Toastmasters standard Green, Yellow, and Red.) When time is up, the screen will pulse from red to black and a custom message will appear, notifying the performer that he or she has now gone over his or her time slot. The audience will never notice, but your performers will get the hint. Fin was designed to be used in live situations, whether that be on stage or in the recording studio. Starting or pausing is as simple as a tap on the screen. Adding or subtracting time is as simple as a swipe, or tracing a circle with your finger. Swipe with two fingers to double or half your time. Even while the timer is running, you can change the amount of time remaining, in case there’s been a sudden change in schedule. If you know how long your time slot is, Fin will help you practice sticking to it. Use Fin during rehearsals to get a good sense of how long you’re going over or under your allotted time. 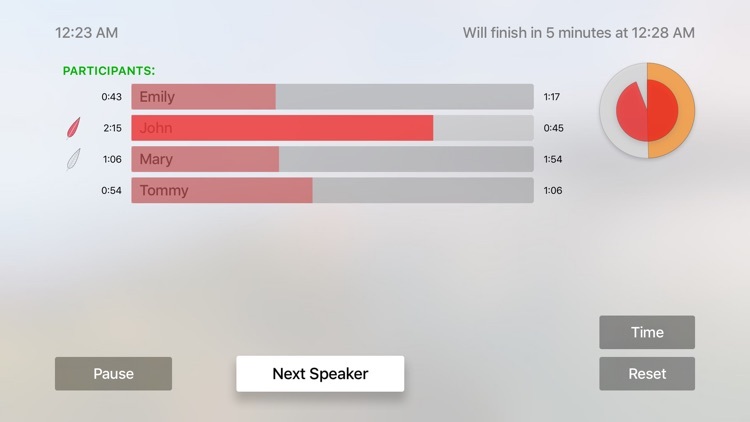 Fin will automatically start an overtime counter once the timer runs out, so you’ll know not only that the presentation is going too long, but also by how much. 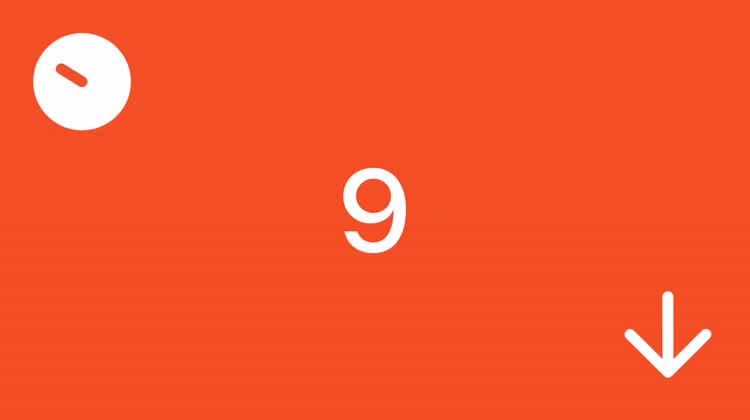 • Large numbers that are easy to read from across a room. • The option to play sounds for warning times or when time runs out. On iPhones with vibration support, warnings can vibrate as well. 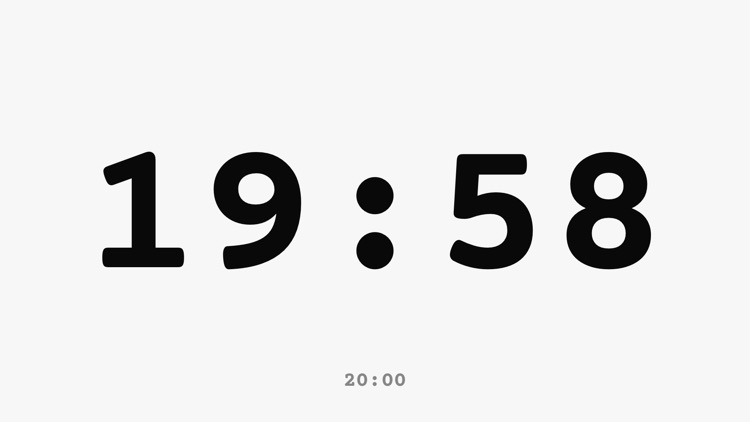 • A custom message for when the timer runs out. • Dark and light themes to match your stage conditions. • The ability to count up or down, and switch between the two, even after you’ve started the timer. • An overtime counter that counts up after time is up. Perfect for rehearsals. • 12 adjustable presets so you can easily switch between your most needed performance times. • Siri Shortcut support. Launch your favorite Fin presets with your voice. • Notifications for when the timer runs out while the device is off, or the app is in the background. • Remote control and syncing of two or more devices running a single timer. • Remote messages that appear full-screen on other remote-connected devices. • Universal app for iPhone, iPad, iPod touch. Works in both landscape and portrait modes on all devices. Universal purchase gives you access to Apple TV version at no extra cost. • Need to switch to another app while Fin is running? No problem. 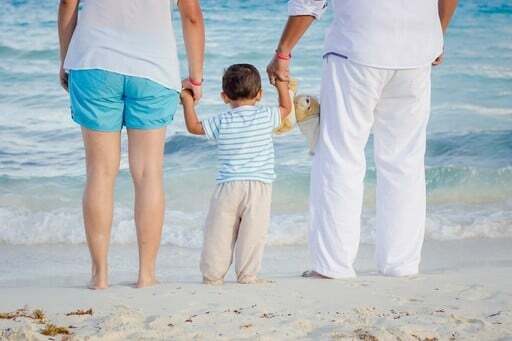 Fin will calculate the time even while you’re gone. 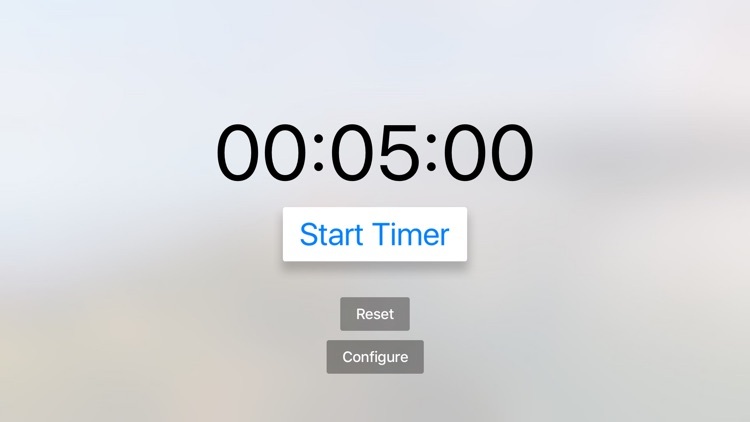 • Remote control of your iPhone timer using Apple Watch. • Local notifications on the Apple Watch at warning and completion times. This simple countdown timer turns your TV into a helpful timer display for home or classroom use. The time counts down in hours, minutes and seconds; when it expires, a ring sounds, the display flashes, and the elapsed expired time is shown. Tap or hold down the (+) and (-) buttons to set the time on the main screen, or press the settings button to choose from a list of presets. The timer will display in either a light or dark theme; sound options and tenths of seconds display can be adjusted in the app settings. 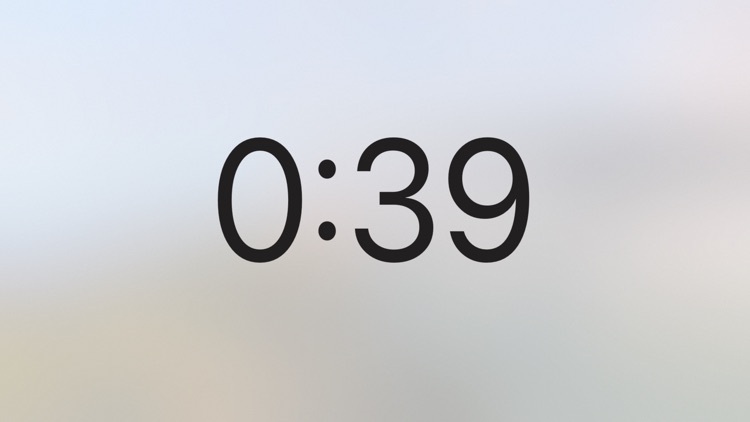 The timer continues to run in the background when switching to other apps (the timer will not ring when it is in the background, however). 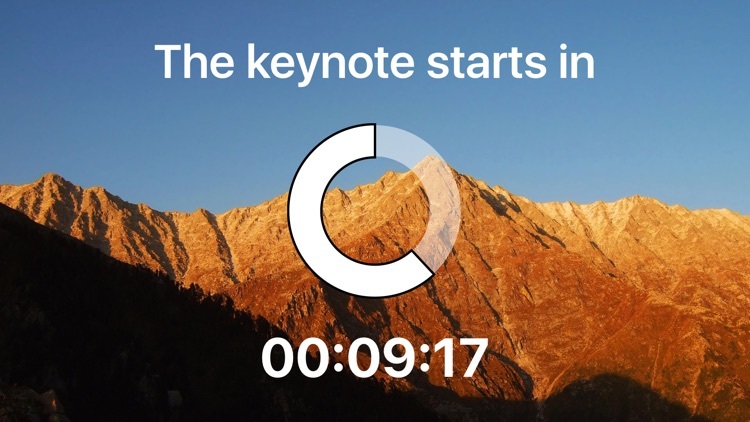 Speak On Time will help you keep your presentation on the dot and your audience happy. * Selectable time display mode: Remaining time, Elapsed time or both. * Easy configuration makes it easy to be up and running quickly. 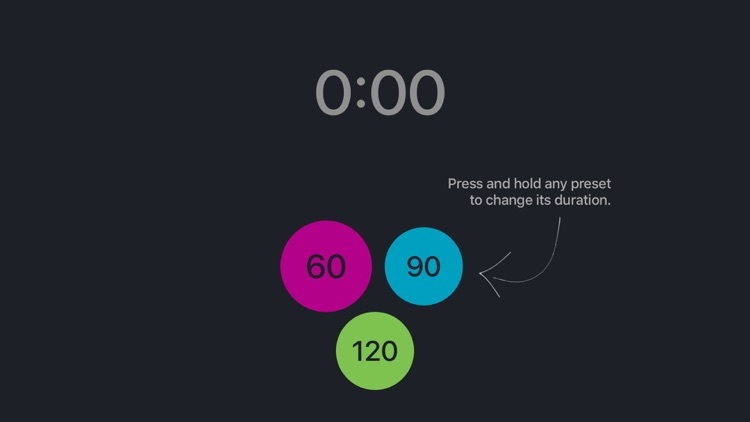 Tabata Pro Workout Timer is all you need for interval training on your Apple TV. 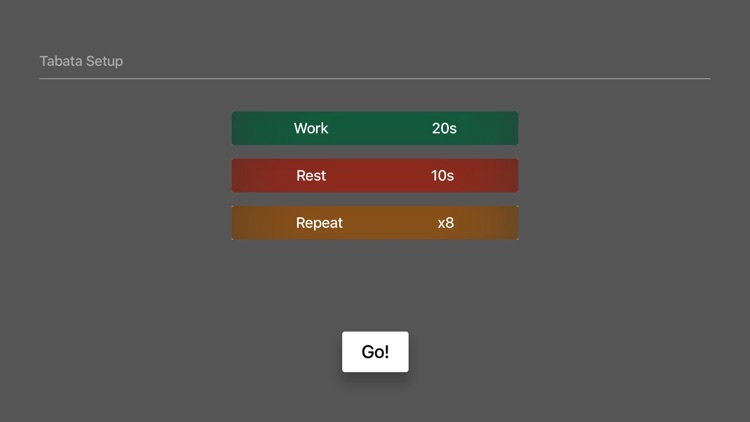 Simple to use -- customize how long your work length is, your rest length, and how many rounds you're going to do, and press Go! We use voice cues that play over any music you have playing in the background so you know just when to stop and rest and when to get moving. Why did we create another timer app when there are already dozens in the App Store? Because “Timer Z is the Last Timer You’ll Ever Need”! It's simple to use yet full featured so you can remove all other timer apps from your device. Whether you’re looking for a simple timer, or one with all the bells-and-whistles, Timer Z is the best choice! NOTE: this version is limited to 2 timers. Use the convenient in-app purchase of Pro feature to add an unlimited number of timers, and eliminate all advertisements. 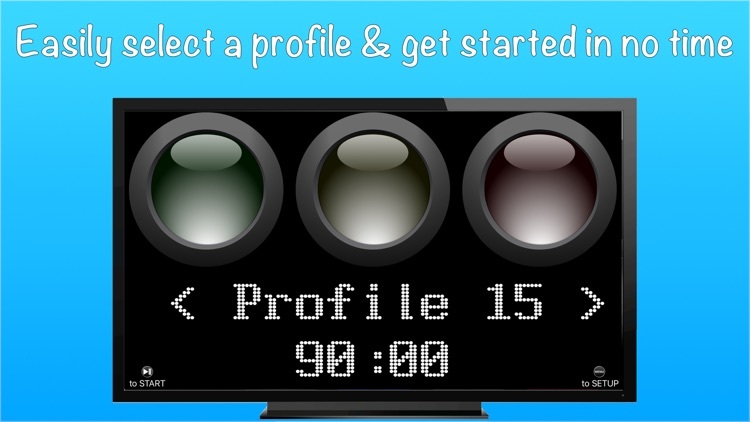 Timer TV is the app you need in your living room, in your room, in the gym at school, at work, and anywhere can serve a comfortable and convenient timer on the TV screen. Use it at school during classes to mark the moments of class with those of pause; Use it at the gym to schedule sessions of exercises and allow athletes to better focus their energies; Use it at the university during the exams for your students; Use it in your company or in a convention to regulate more precisely the timing of the meetings give each speaker the scheduled time; Use it in the kitchen to cook your recipes at the right time and get the dishes cooked to perfection; use it in the evening when your children should brush your teeth for a perfect cleaning as they look pleased as long as you approach the end of the task. • Steel: the professional theme, suitable for the workplace, sports and education. • Energy: the perfect theme for physical activity, for cooking and fashion environments. • Snow: the theme with a sophisticated aesthetic that fits perfectly in contemporary contexts as start-up companies, modern environments, houses with a sophisticated design. Quickly set an audible alarm (the tinkling of a bell) at the end of the countdown. 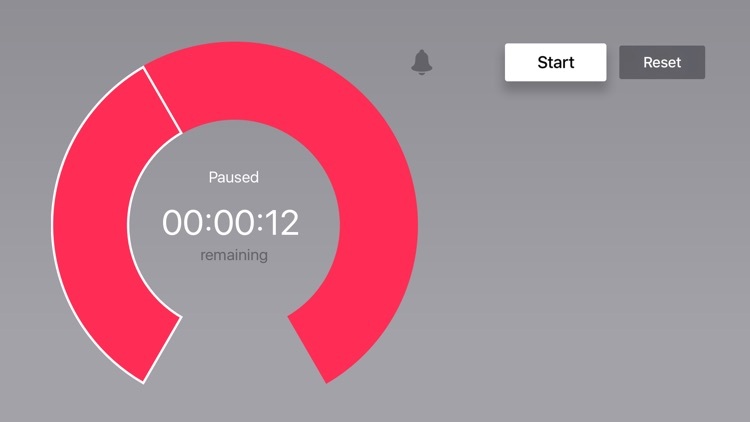 Use the Play/Pause button of remote to start and pause the time. Set the timer time in according to your needs, from a few seconds up to twenty-three hours and fifty-nine minutes. 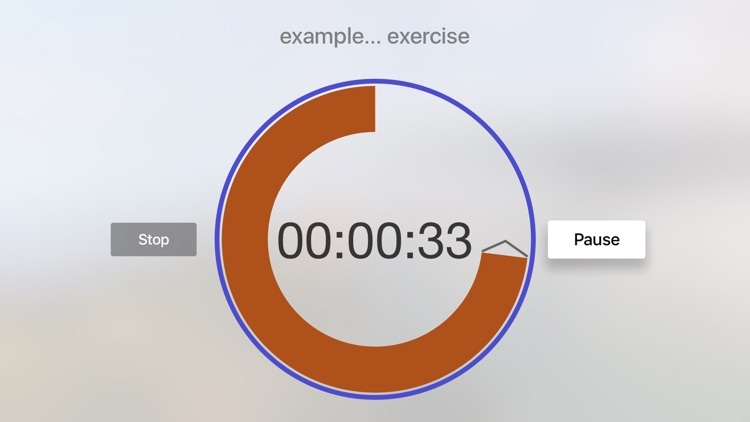 Timer TV is designed to work as foreground app, when placed in the background using a different app or different services of the device, it automatically switches to pause. 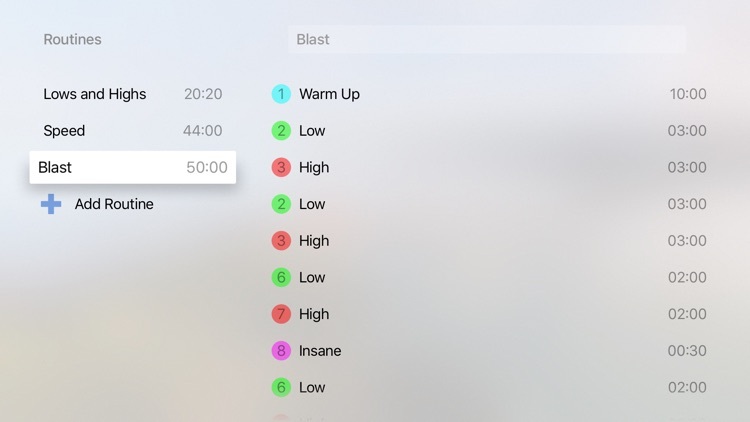 Create your own workout routine with this simple yet powerful interval timer for your Apple TV! Countdown gives you one tap access to your three most used timer presets, whether you’re timing a boiling egg or intervals between workouts. - Adjusting presets is just a tap away in Settings. - Timer alarms sound without requiring you to tap “Done” or interrupting your music. 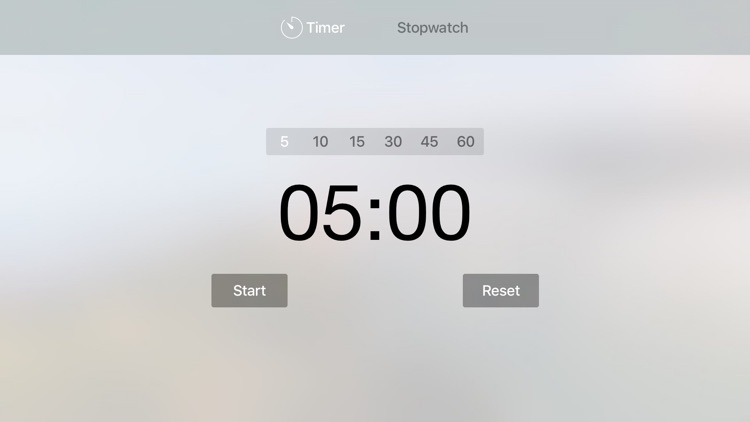 - Quick Actions for iPhone 6s and iPhone 6s Plus to quickly start timers from the home screen. Digital stopwatch with big numbers. It is good for party game or Lightning talks! Enjoy big stopwatch also with Apple Watch. This app contains in-app purchase. You can remove ads and theme selection limit by purchasing upgrade. With Laboratory Timer’s gorgeous interface and user friendly navigation, it has never been easier to manage scientific experiments. You can also use your Apple Watch to visualize all your timers in real-time, and get notifications on your wrist. 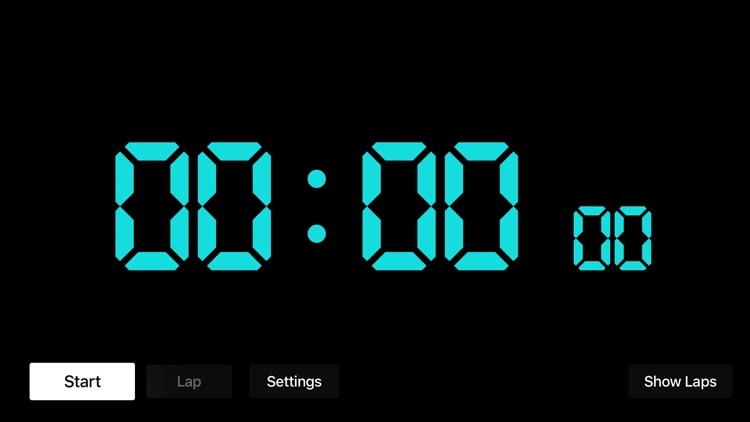 To use the Laboratory Timer app just pull down to add a new timer, set the duration and press “Play”. 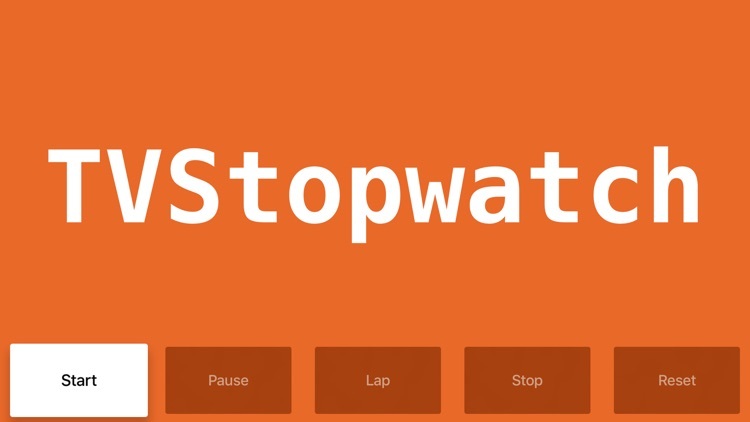 TVStopwatch allows you to use your TV as a fully-featured stopwatch. You can pause at any time (which freezes the stopwatch). Lap timing is also included, which lets you freeze the display, while the stopwatch keeps running. A large font is used, making it easy to see the elapsed time without effort. This could be very useful while working out.